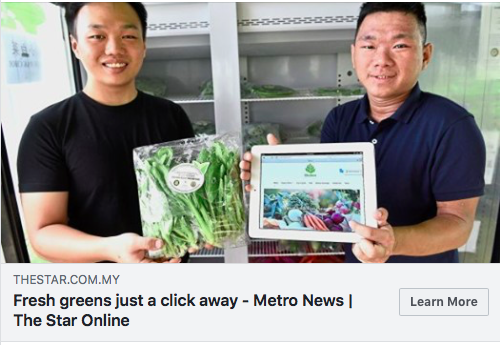 We were so lucky to be featured in The Star Online news today. As a star-up company in Penang, we've received so much supports from community and government. 1) Support local farmers and make their farming business sustainable. 2) Introducing new technologies IoT & Big Data to improve the productivity. 3) Cutting out the role of middlemen to make both side profitable by using Ecommerce. Ekebun open up transparency of foods to let customers know the source of products which consumers feel safe to eat. Currently, we deliver fresh organic vegetables 3 days a week to customer doorstep, no delivery charge order above Rm30. For new customers, use WELCOMETOEKEBUN for 10% off. 2) Engineers with IoT & Big Data skills. Special thanks to The Star reporter Intan & photographer Gary Chen, they made this a successful article.